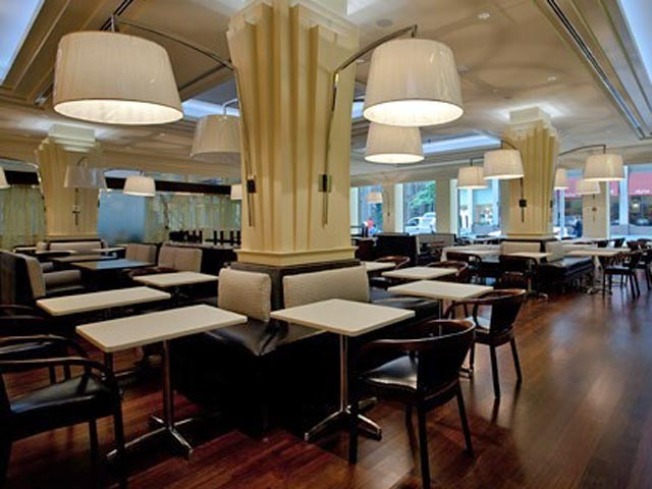 Rock Center: Three weeks ago, three starred seafood spot Oceana closed its location on 55th and Park for a big move to Rockefeller Center. The move was due to a lease dispute, but owner Nick Livanos has complained that crowds have dwindled of late, perhaps due to the restaurant's dated look. And like Aureole before it, the restaurant hopes it will bring along its regulars and attract a new crowd to the bigger, shinier, power lunch-dependent space. The new location, at 1221 Avenue of the Americas (49th St.), is divided into a café/bar/raw bar, dining room, and chef’s room all anchored by a giant glass wine cellar and a huge (oh yes) lobster tank. The cellar, which can be used for private dining, is outfitted with nine silk covered light fixtures that resemble jelly fish, while the bar tiling looks like oyster shells. She won't be fully open to the public until next month, but friends and family mode is just around the corner.